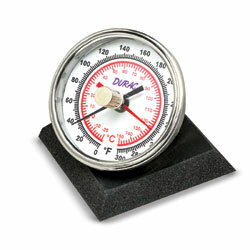 Waterproof and pressurized, this 304 SS bimetal thermometer is designed for your autoclave. It has a glass lens and features a removable silicone sleeve that keeps moisture away from the dial. So easy to use; simply turn the reset knob until the red pointer meets the black temperature-measuring pointer, then place into your autoclave. When the sterilization cycle is finished, the red pointer indicates maximum temperature reached. Thermometer includes a certified calibration report at 121°C.